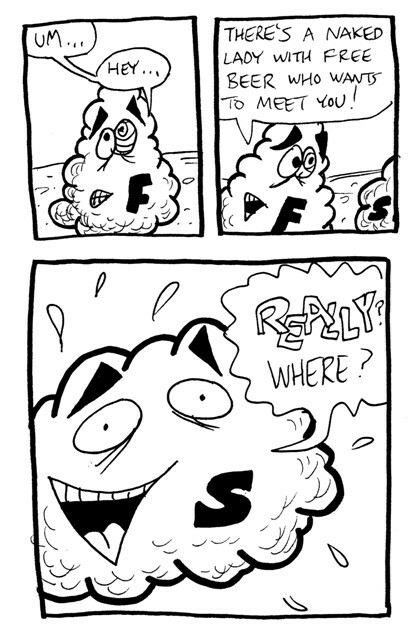 This joke is a pretty good indication of what Scuzzball is all about. As I mentioned earlier, Fuzzball and Scuzzball were created when we were in grade school, then revived when we were in high school. When I revived them, I thought Scuzzball should be scuzzier. To that end, I made much of his dialogue about hookers and booze. When I write them I try not to make him a one-note character, but sometimes it's hard to avoid. I think the expression of innocent glee on Scuzzball's face is what really sells this page.